BRYAN EATON/Staff photo. 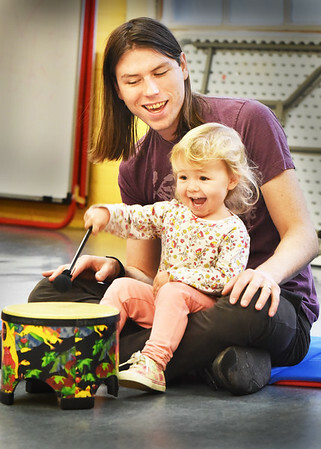 Sabrina Merritt-Jones, 2, of Newburyport, with dad, Jon, gets into the beat as she takes her turn with the drum in "Music Rocks" at the Newburyport Rec Center. Claudia Keyian leads the group of toddlers in different interactive introductions to the music world on Tuesday mornings sponsored by the Department of Newburyport Youth Services.